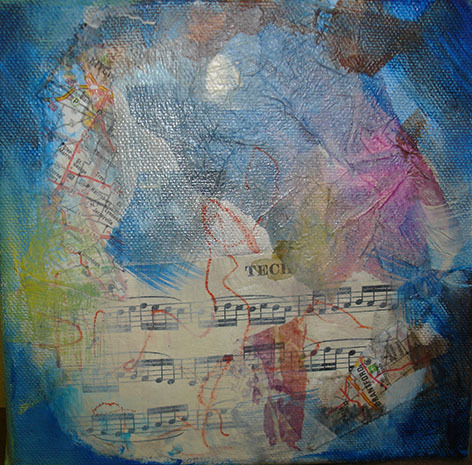 Ruth Hayes "New Growth" Mixed media $500. 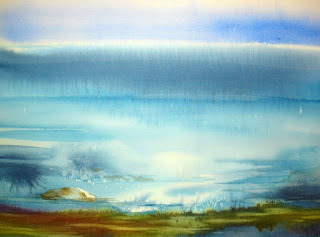 Working with watercolour over many years it has felt important to learn the rules and different ways of working with it. There are many ways but watercolour is a transparent medium and it has taught me many lessons and perhaps the greatest has been patience and acceptance. First washes must be allowed to dry before second washes and glazes are added. The medium often seems to have a will of its own and I have learned to appreciate the flowing and spontaneous surprises it offers. However there are many wonderful mediums and what happens when they come together? Pastel has always been a love. There are some amazing pens and markers on the market today that add exciting line and marks. Acyrlic or gouache can cover up mistakes or provide dynamic splashes of colour and intensity. What I have found the most fun is collage. 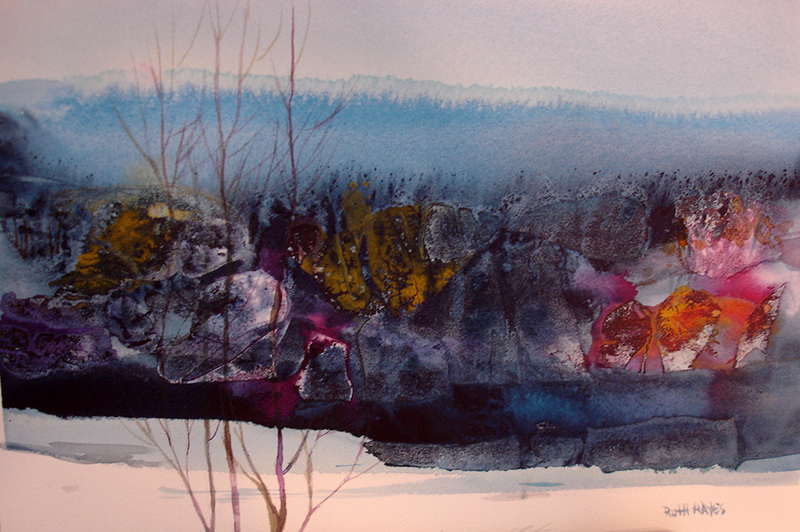 Some cut up pieces of old paintings create interesting juxtapositions of texture and colour. Then the challenge is to pull it all together. These works might be on paper, canvas or board. It has been fun embracing all the media and some of these efforts will be in the upcoming Beach Studio Tour May 3rd, 4th and 5th this spring. 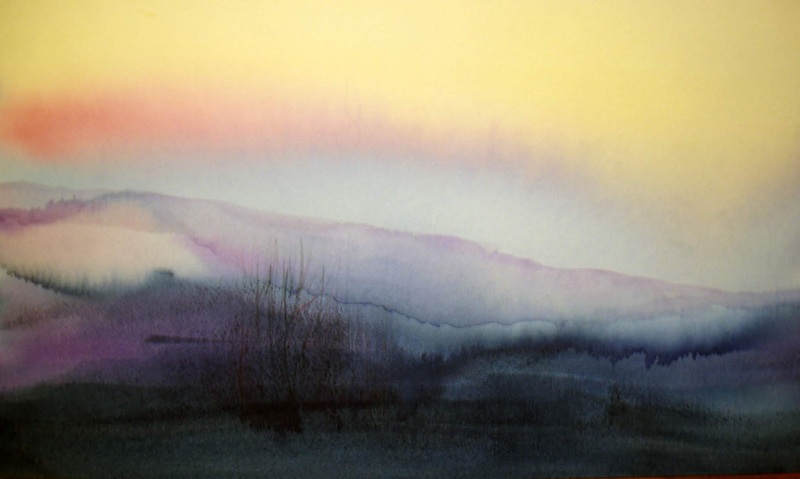 "Evening Light" Watercolour R. Hayes 13"x20"
I love to apply colour like words that shape poems like notes that shape music. 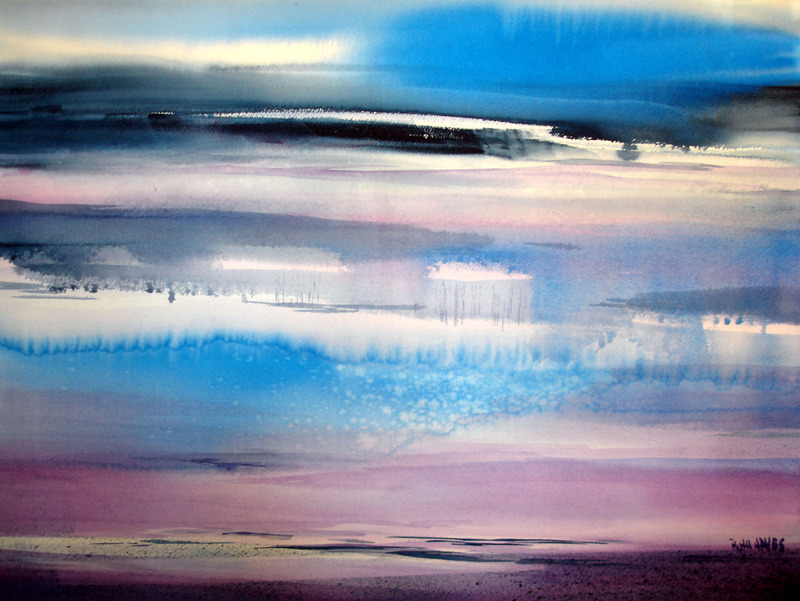 It's often colour in a painting that will evoke an emotional response to a painting. Rothko made use of the concept in his beautiful abstract colour work. The Impressionists used colour and light as a basis for many of their paintings. It is February and close to Valentine's day and red seems to be the colour of the month. 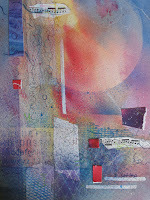 Red or any colour can hold varied meanings for each painting and individual. Having a training in art therapy I often come across studies or will be asked the meaning of a particular colour. That is so unfair to the colour! To focus on red in honour of valentine's day it is obviously associated with love, romance, and passion. From there it is also life giving, fun, and if you are five a favorite colour. If I am five I might want the red balloon, the red lollipop and love the red paint. At thirty five dripping red paint across a painting could find me accused of hidden rage and anger. Is it in the painter or a projection of the viewer? Red is only red. 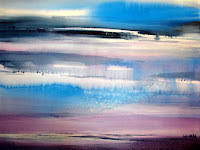 As a painter all the colours are unique and the response evoked in each viewer can be different and complex. The painter might put forth one particular meaning but the viewer might find another. It's time get back to splashing my cadmium red across a white canvas. I'll let the red speak to me and see what colour it might like next. Perhaps that's mad or just being an intuitive painter. At one point in my life winter was to be endured and hated. There are still moments when it is like that do but it helped a lot when I started finding the beauty in it. That can be said of almost anything in life. It helps to find the hidden blessings. As artists it can be difficult to start a new painting, spoil that white with first marks and also hard to let it go and call it finished. There are jokes that a painting is never finished as long as it is still in the possession of the painter. That seems to be what this Holiday season is all about as it celebrates the end of a year, end of the shortest day but welcomes the rebirth of hope and creating anew. May this season bring joy and creative renewal to all aspects of your coming year. January is when I offer new classes and workshops. Although it is easy to hibernate for the winter months it is also a time to brave the cold and be awed by the exquisite light on the lake or the beauty of snow. It's fun to just play with colour and paint trusting that something will emerge. My classes are fun, but informative and students are encouraged to explore their own expression using the medium of watercolour and some mixed media. This winter two morning classes are offered and one Thursday evening session. Thursday Evening six week session starts January 17th at 7:15 pm. Check my class page for more details. My wish is that the New Year is happy and creative and full of happiness for you! 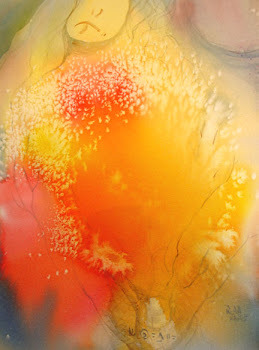 Warm vibrant colours in loose, contemporary abstractions and landscapes. 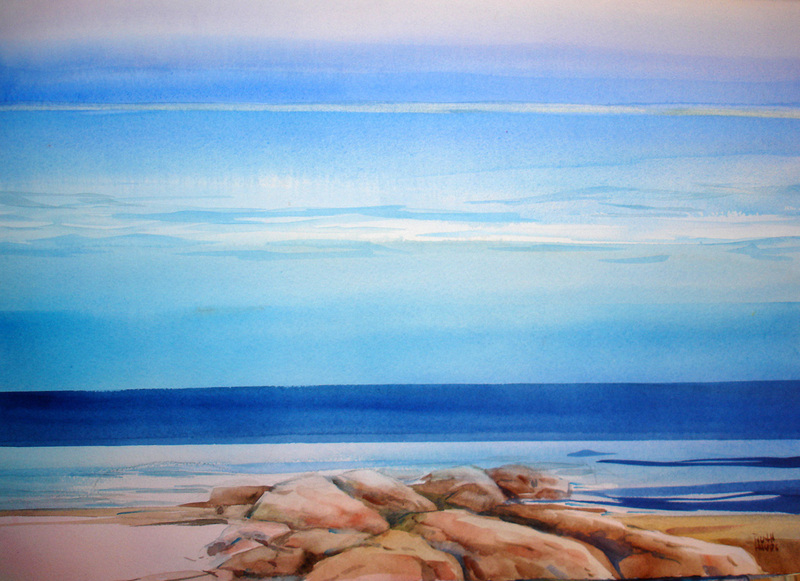 A warm invitation is extended to view recent watercolours and acrylics during the month of November. location: Essentia - 2180 Queen St. E.
6-8 pm It would be great to see you. September for many is seen as the start of a new year and if nothing else it heralds a cycle of new learning and a return to familiar routines. With the arrival of Fall new morning watercolour classes on Monday mornings and Tuesday mornings will be offered. as well as Thursday evenings. I have been asked for more day classes and this Fall I am trying it. The classes are six week sessions that are small, relaxed but informative, and with an approach that encourages your own expression and creativity. It's a joy to see returning students and I welcome new ones. No experience is needed. Classes Start Monday mornings September 17th, Tuesday September18th at 10 am and a Thursday evening September 20th at 7:15 pm. Check out my classes page. Watercolour is a special love of mine but experimenting with other media and incorporating them with watercolour has been a theme this summer. I totally enjoyed watching the wonderful results emerge from students in my summer art camp. Art is a journey and staying open to the creative insights that come is a gift.